Mortgage rates are rising slightly in the traditional home buying season but Americans are still active in the housing market. The National Association of Realtors say home sales jumped more than 6% last month posting their best numbers in 4 years but the question is how long can this momentum stay? Our business editor Peter Howe is in the studio with some possible answers. Sales of existing homes jumped 6.5 percent in July across the United States to an annualized rate of nearly 5.4 million homes, the National Association of Realtors reported Wednesday. It bolsters a picture of a strong recovery in the all-important housing sector of the U.S. and all the goods and services -– from furniture to landscaping – housing drives. But because many homes finally sold in July probably went under agreement in April or March, before May’s sudden jump in interest rates, the big question remaining: Was July a positive blip that won’t last? July sales were the highest rate since November 2009 – numbers juiced by the first-time homebuyers tax credit – and if you ignore that tax boost, July’s numbers were actually the highest monthly numbers since March 2007. The May-June-July period was the first time annualized existing home sales exceeded 5 million for three straight months since 2007. 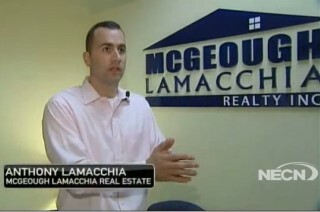 But Anthony Lamacchia, owner of Lamacchia Realty Real Estate in Waltham, Mass., is doubtful the streak extends. “I don’t think it can last, because of mortgage rates,” Lamacchia said. Interest rates for 30-year mortgages are now a full percentage point higher than they were in March and April, and what that typically means is someone who could have afforded a $400,000 or $500,000 house has to drop down to $350,000 or $450,000, which overall depresses total demand. Lamacchia expects August and September national home sales data will show an overall drop. Lamacchia is also worried about what happens to interest rates, and housing demand, once the Federal Reserve stops just hinting at ending policies that have kept interest rates at rock-bottom lows and starts actually acting. “All they’ve said is that at some point, as things continue, we’re going to decrease our bond-buying program — but just because of that, investors are pulling out and it’s driving interest rates up. So the thing that concerns me is what happens when they actually stop buying the bonds?” Lamacchia said.